Live in the Rio Grande river basin & interested in #COwater & @COWaterPlan? Check out http://t.co/HvRGD0zHln & head to a public mtg. If the snows keep coming, the San Luis Valley might rise up to an average water year yet. Snowpack in the Rio Grande Basin is currently 87 percent of average, Colorado Division of Water Resources Division 3 Engineer Craig Cotten said on Wednesday. He said the snowpack is not quite up to average but is better than it has been the last three years at this point. The stream flow forecasts for this year are all over the board at this point, Cotten added. Some in the southern drainages are predicting as low as 40 percent of average this year while the Saguache Creek, on the northern end of the Valley, is forecast at 116 percent of average. Most are in the 80-percent-of-average range, Cotten said. “But we have a couple of months to go,” he added. Irrigation season has begun on a couple of the smaller streams, as of March 12, but typically the official season begins April 1. The Rio Grande Water Users Association , for example, voted April 1 as its irrigation start date. Cotten said his office is meeting with irrigation companies and water user groups yet this month to discuss further irrigation turn-on dates. On another water-related note, Cotten said the water division was going to start cracking down on folks who have exceeded their fiveyear average on acre-foot limitations for their wells but decided to incorporate those rules into the pending groundwater regulations. That means those rules will go to the water court as a part of the overall groundwater regs this spring and go into effect when the water court clears them, if there are no objections. If the rules are promulgated this spring and go into effect next spring, the water office will use the 2011-2015 time period to calculate the five-year average for those under decreed well limits. Cotten said his office has a list of people who have already or will likely exceed their annual pumping limitations, and they will receive letters this year so they know what could be coming down next year. For the past several days, the Sangres have worn scarves of snow clouds. The mountains shine with snow, an optimistic sign of water. As of March 11, SNOTEL reports for South Colony show 67 inches of snow, which equates to 17.2 inches of precipitation. On March 10, South Colony registered 70 inches of snow, which means three inches melted over two days. March shows an increase from SNOTEL readings in February, which registered 50 inches, or 15.5 inches of moisture. In January of this year, the reading was 41 inches of snow, with 13 inches of precipitation, so clearly March has bounded ahead in water accumulation. The entire Arkansas River Basin stands at 101 percent of the long term average. 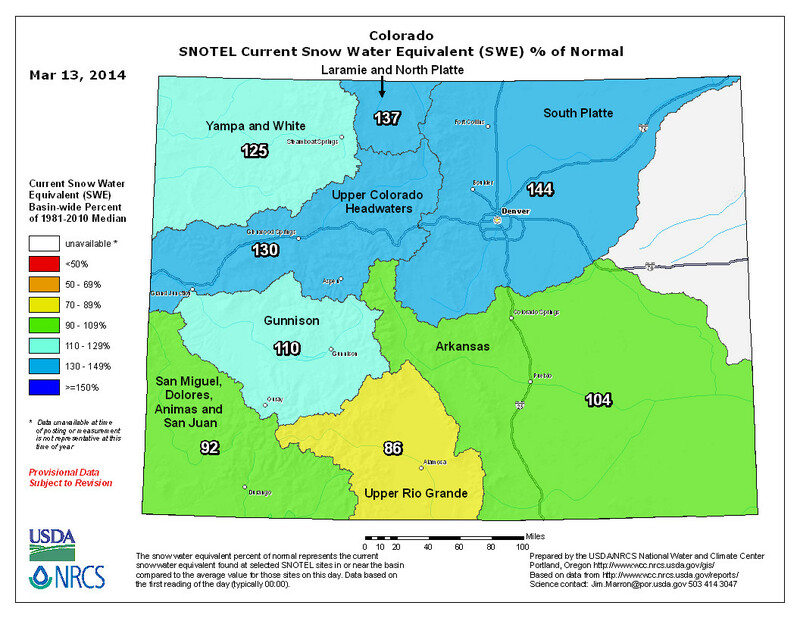 So far, water percentage for the entire state of Colorado is 108, compared to last year’s 150. Statewide the snowpack is 116 percent of median, with February’s precipitation total reaching 133 percent of average. Last year in March snow pack was 161 percent of median. In 2014, the reservoir storage percentage sits at 87, in contrast to 67 recorded in 2013. In the state, the deepest snow depth is recorded at SNOTEL station Tower at 134 inches, which equates to 46.6 inches of precipitation. At 10500 feet, Tower feeds the Laramie and North Platte River basin. Max temperature average at South Colony, elevation 10,800, on March 11 was 9.4 degrees. A dispute between Colorado ski areas and the Forest Service has caught the attention of the White House, which on Thursday threatened to veto a water-rights bill that U.S. Rep. Scott Tipton, R-Cortez will present on the House floor today. Meanwhile in Denver, state senators delayed a vote on a related bill by Sen. Ellen Roberts, R-Durango, out of concerns that it improperly singles out the Forest Service. The bills in Washington and Denver address an effort by the Forest Service to gain title to water rights used by ski resorts that lease federal land. “This is important to the West. We hope the president won’t politicize this because this isn’t a Republican or Democrat issue,” Tipton said in a phone interview. Cities that have reservoirs on federal land worry that if the Forest Service can take ski water rights, nothing would stop them from claiming reservoirs, too, Moseley said. However, Sen. Matt Jones, D-Louisville, defended the Forest Service and said most Coloradans would support the principle of keeping ski water rights reserved for skiing. “This isn’t the mean old federal government telling people what to do. This is the steward of our lands,” Jones said. Sen. Jessie Ulibarri, the committee’s chairman, delayed a vote on Roberts’ bill, saying he thinks it’s an important topic but that the bill might illegally single out one entity, the Forest Service. As the hearing was happening in Denver, the Obama Administration lowered the boom on Tipton’s bill in Washington by releasing a “statement of administration policy” – essentially, a veto threat. The U.S. House is scheduled to vote on Tipton’s bill today. It would forbid federal land-management agencies from claiming water rights as a condition of a land-use permit. Tipton has allies, as well. The influential U.S. Chamber of Commerce has come out in support of his bill, and it is expected to pass the House this afternoon. However, the version of Tipton’s bill in the Democratic-controlled Senate has stalled and has not received a hearing, and Obama’s veto threat could seal its fate. The U.S. House on Thursday passed a controversial bill triggered by the U.S. Forest Service’s equally controversial move to assert federal ownership over water rights held by ski areas to tap public streams for snow-making. The Water Rights Protection Act had the backing of virtually all ski resorts in the United States. Among them are 13 ski areas in Washington, including Crystal Mountain, The Summit at Snoqualmie and Stevens Pass. But the National Ski Areas Association in recent weeks had been pushing lawmakers to narrow the legislation’s scope out of fear the Democrat-controlled Senate would otherwise reject it. Rep. Jared Polis, a Colorado Democrat and one of the bill’s 15 co-sponsors, withdrew his support and pushed for an amendment to restrict the bill only to ski-area permits. Instead, House Republicans approved a broader bill that would apply to the Interior Department and the Department of Agriculture, agencies that encompass the Fish and Wildlife Service, Bureau of Land Management, National Park Service as well as the Forest Service. Rep. Doc Hastings, R-Pasco, chairman of the House Natural Resources Committee, managed the bill on the House floor as Democrats denounced it as sloppy legislation that would bring far-reaching consequences. Democrats also repeatedly pointed out that Hastings’ committee held the only hearing on the bill on Oct. 10, in the middle of the 16-day federal- government shutdown and with no witnesses testifying in opposition.